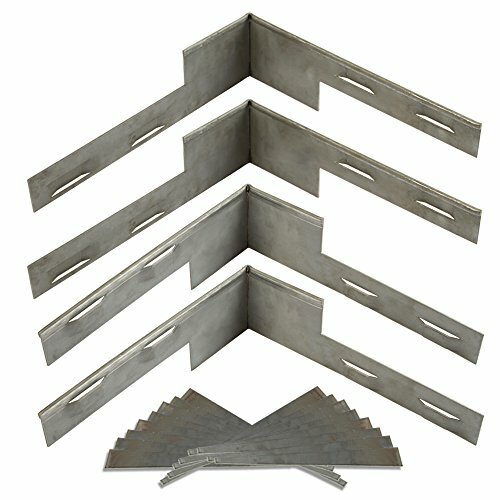 Corner kits by Coyote Landscape Products are a singlepiece of steel edging bent to form a 90° angle with pre-punched sections for installing the stakes. These pre-formed cornerpiece are used to connect twopiece of edging together to form a perfect angle. Kit comes with 2 inside cornerpiece, 2 outside cornerpiece & 16 raw stakes. The inside or outside configuration lets you match the seam of the roll top corner to match the seam on your roll top edging. Each kit comes with four 4-inch by 12-inch by 12-inch corner pieces and 16 stakes. The kit includes two inside corner pieces and two outside pieces to complete your project.